The BBCs Victorian Farm program was described as a "surprise hit" and the team are back now for Edwardian farm. We will be updating information about the crafts and craftspeople shown in the program and of course we are delighted that Alex Langlands one of the shows presenters is a patron of the Heritage Crafts Association. Alex will be speaking about Edwardian Farm at the HCA spring conference at the V&A in March. 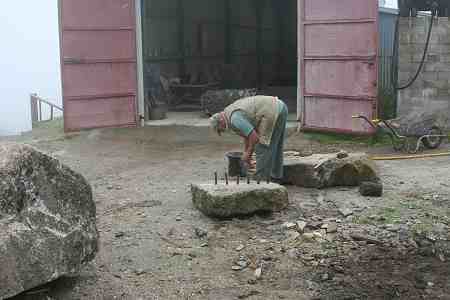 So in the first installment we visited stonemason Ian Piper on the edge of Dartmoor where he works the local granite. 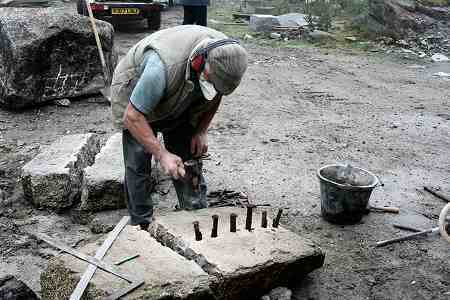 Ian showed Peter Ginn how to split the granite using plugs and feathers. It was a joy to see such simple technology work so well. in the hands of skilled craftsmen. We also met the only operational Tamar barge the Shamrock. and met her skipper and restorer Peter Allington who says of sailing her "I hate to shatter people's illusions, but to be honest she's actually abysmal to sail. I can only describe it as being like trying to push a large and loaded shopping trolley across a slope"
Built in 1899 by Frederick Hawke of Plymouth for Tom Williams, SHAMROCK is a sailing ketch built for cargo work on the River Tamar and estuary in South West England. Her construction was of pitch pine and oak. From 1899 to 1962 she worked as a barge plying her trade though with several changes of ownership. In the late 1930s she moved from Plymouth to the Truro River where she operated in several Cornish ports. In 1962 she was sold as a diving support vessel and later became a salvage vessel between 1966 and 1970 when she fell into disrepair. The National Trust acquired her in 1974 and she was towed up the River Tamar to Cotehele Quay for restoration. This was a major joint project between the National Trust and the National Maritime Museum. SHAMROCK is the centrepiece of a display at Cotehele from where she makes occasional voyages on the River Tamar. I am always interested in old wooden boats and how each region had their own design to suit the local conditions and uses. Boats like this are recognised as part of our national heritage but the skills to build them are not. I suspect it is many years since the last Tamar barge was built and probably no one remembers the subtleties of how it was done. In Japan and France there are schemes to make sure the skills to build new boats as well as repair old ones are passed on so every 20 years or so a new boat will be commissioned built from scratch allowing the older generation to pass the skills on. On the domestic side of things Ruth made a rag rug and as a more industrial craft we had a really good demonstration of lime burning. This was a real eye opener for me as I know many derelict lime kilns locally and my workshop along with most of the old stone buildings around here is built using lime mortar made in exactly this way. Definitely concur, what a great programme. Instead of the usual "look how difficult it is for us moderns to do this", the focus was on execution of the craft. The show was a real gem. Despite the dubious claims of the mass produced ‘plastic’ boat industry for their products there always had been a coterie of Wooden Boat enthusiasts. Fortunately there are still professional craftsmen and women (Gail McGarva) building Wooden Boats. There is also a growing interest in building and restoring wooden boats among DIY’rs, and more and more boatbuilding academies are teaching wooden boat building skills. Some of this interest may be a result of the prevailing economic climate. However, those of us who have old wooden boats just know that the plastic variety do not compare. Gail will be speaking at the HCA spring conference at the V&A about her work particularly the recent Lymme Lerret build. It is important to differentiate between the skills of restoring and conserving old boats and building new, they are not necessarily the same.